← For peace sake (and the most amazing salad recipes)! Think about how you feel when you’re in a pitch dark room and suddenly you open a door and allow in a sliver of light… Somehow this tiny bit of light has the miraculous ability to light up the room! Bringing light – the literal and metaphorical kind – to this darkness is what the holiday of Chanukah is all about. 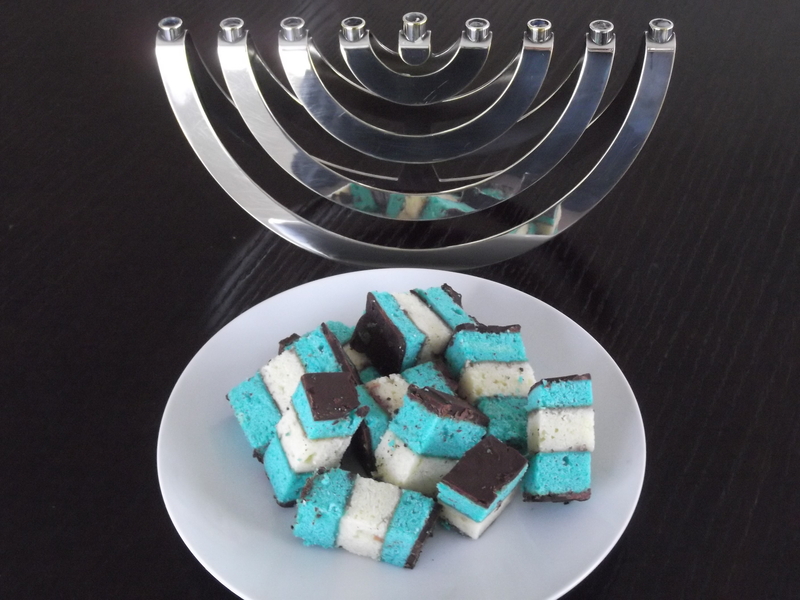 To help celebrate, I have recently started a tradition of making these Rainbow Cookies a la Chanukah. Colorful with a moist and rich almond interior, these cookies are intensified with a hint of acidic fruit and a touch of bitter chocolate. And in the spirit of Chanukah, they will surely “light up” the faces of your family and friends. Enjoy the recipe and may you and your families bring much light from darkness! 2 Responses to Light up! Can’t wait to enjoy your cookies!